Atomhenge is a new CD label started by Cherry Red Records and they have the license to re-release the entire Hawkwind catalog from 1976 up to 1996. All the music has been remastered by Ben Wiseman from the Audio Archiving Company in London. Most of the CDs to be released will contain unreleased tracks, some that have not ever appeared before. These two 3-CD box sets are tasters for the CDs that will be released over the next year or so. Most of these CD releases have been out of print for some time and in the case of the Charisma year material, for a long time. The first box set, from Atomhenge to Earth Ritual (1976-1984), starts off with a never heard before extended version of Reefer Madness. I was pretty blown away by this one as it is extended by more than two minutes in the middle section and it is really cool. The track is actually exclusive to this box set and will not be on the Astounding Sounds, Amazing Music CD. Each CD in this box contains one to three of the rare or totally unreleased tracks, while the other box set is only tracks from each of the upcoming CDs. They also both come with extensive books with liner notes by Hawkwind biographer, Ian Abrahams as well as a lot of rare pictures. Anyway, CD one is tracks from Astounding, Quark and the Hawklords material. 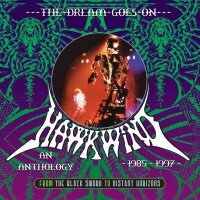 CD2 begins with three unreleased versions - 25 Years (an alternative mix), and non-cross faded mixes of Freefall and The Only Ones, all Hawklords numbers. Next is selections from PXR5 (long out of print on CD), and Levitation era material. CD3 begins with material from Angels of Death, 2 tracks from Church of Hawkwind, Silver Machine/Psychedelic Warlords 1982 single, Choose your Masques, Zones, Earth Ritual, and ending with live material from 1984 from the Stonehenge and Undisclosed File releases. Solid set of songs and often the best songs from most records. The second box set takes us from 1985 to 1996 starting off with the Chronicle of the Black Sword material and Live Chronicles making up most of the first disc. One track from Out and Intake, four from the Xenon Codex and four from Space Bandits are finishing off Disc 1 and starting Disc 2. The best material from the Palace Springs CD is included and sounds excellent. I was surprised that two tracks from the excellent California Brainstorm release are included (I was at this concert). Three long tracks from Electric Tepee and finally material from It’s the business of the Future to be Dangerous end Disc 2 and start Disc 3. A curious choice of songs from the Business Trip is selected, White Zone and Alien 4 CDs. It is nice to see the Lord of Light from the Love in Space EP and the Alien 4 (Roswell Mix) appears. The CD ends with four tracks from Distant Horizon. I have made a comparison with the original CD release as it was said that the version that was released of Distant Horizon was not the final mix so I was curious if we will get the real record or not. It appears not but I can say that the sound is improved here over the original CD release. 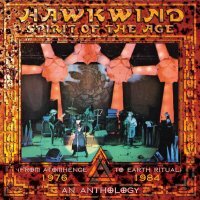 I have all of the Hawkwind CDs released and I can say that the sound on these box sets is extremely good and in the same quality as what Cherry Red has achieved with the MAN re-release series the label has undertaken the last two years.